You can make changes to your user profile at any time, change your password, update your age, change what is displayed in the diary and more. To make changes to your user profile, click on the ‘Edit Settings’ button in the main diary. You can select a password, or remove your current password. You can update your gender. Your suggested calorific allowance is affected by your current age, so keeping this option up to date will ensure you get the most accurate suggestions. The country selection is useful if you are on vacation, changing it will change the items returned by the food search to ones relevant to your location. You can change the weight and measurement units to display your results in metric or imperial units. This can be useful if your doctor would like to see your results in metric unit, but you prefer to work with imperial units on a day to day basis. 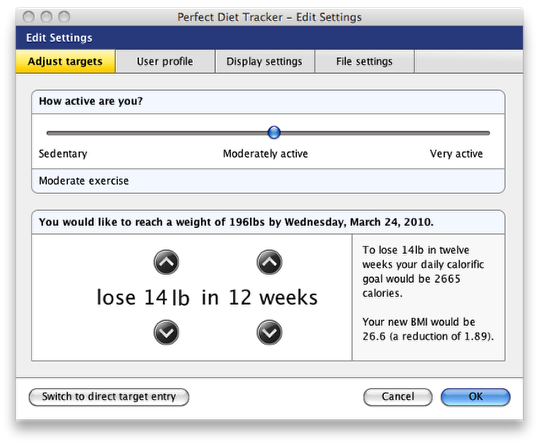 Keeping your height up to date ensures the software can make the best suggestions for your calorific allowance. You can select metric or imperial units for distance. Distance units are used for exercise calculations, and are typically miles per hour or kilometers per hour. You can choose to work with either calories or kiloJoules, and swap easily between the two units. Select the ‘Display options’ tab and you can change the items displayed in your diary, and the reports. Reducing the number of items displayed can make the diary and reports easier to read. All the information is always tracked, so you can return to this screen and turn on any of the options for a full report at any time. The ‘show subtotals’ for each meal will force the diary to total up the calories used for each meal and place the totals in the meal bar line. The ‘Include alcohol in the nutrition pie charts’ option lets you remove alcohol from the pie charts. The ‘shaded box highlights group items in diary’ option lets you choose between having groups displayed in the main diary within a shaded box, or simply as part of the main list. Finally, you can choose to display the nutritional profile totals as either a percentage, or in grams, and if you want to use a new product input form from another country (for example if you live in a country that imports a lot of food from another), you can choose the form you would like to use here. 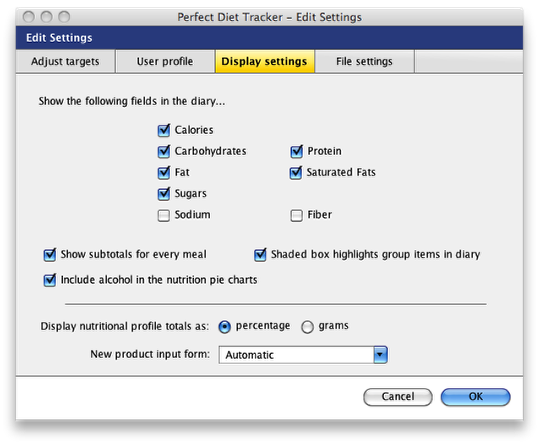 The ‘File Options’ tab lets you change where the Perfect Diet Tracker stores its data. We recommend you always backup your data before changing the location of the data files, a handy link has been provided in this window to let your backup your data. If you have multiple computers and a shared ‘always available’ network drive you can change the location of the data files to the network drive and keep the diet tracking information in sync across all your computers. 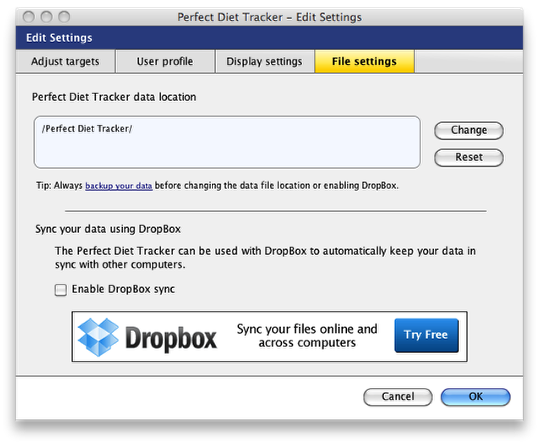 If you do not have a network drive, the Perfect Diet Tracker also has support for the DropBox service. There are two levels of DropBox service at time of writing, a free ‘Basic’ service, and a full ‘Pro’ service. 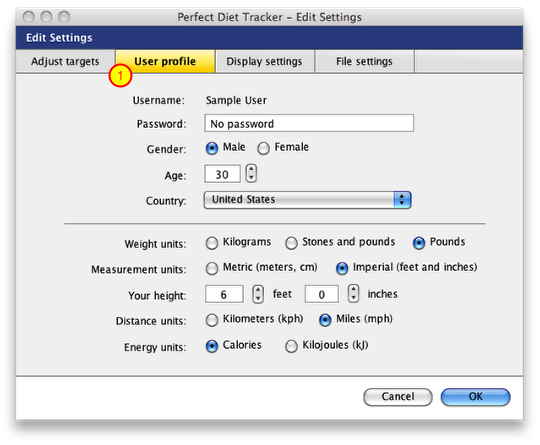 The Perfect Diet Tracker will work with either the Basic or Pro options. DropBox is fully cross platform, so you can sync a PC and Mac using the service. To enable the DropBox sync simply select the ‘Enable DropBox sync’ option. If the software cannot locate DropBox on your computer it will display a screen to let you create an account. New to version 3.3, the adjust targets screen is now located within the user settings area. Simply select the ‘Adjust targets’ tab and make any changes to your targets you would like. If you would like to specify your own calorific target, click the ‘Switch to direct target entry’ button in the bottom left of this window. When you add your first computer to the DropBox service it will automatically upload its data to your DropBox. When adding a second computer because there is already data in your DropBox and on the computer, the software will ask you which copy of the data you want to use. If your data is up to date on this computer you can select the first option (1) and the software will overwrite the data in your DropBox with your current data. All your other ‘synced’ computers will then be updated to use the data on this computer. If the data in your DropBox (the information from the computers already synced) is correct, you should select the second option (2) to sync this computer with the data in your DropBox account. 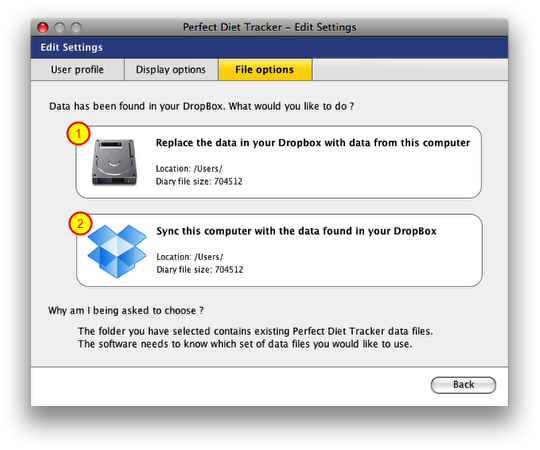 When using DropBox we recommend you give your computer a few seconds after turning it to allow it to sync your data before opening the Perfect Diet Tracker.